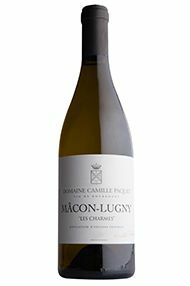 Camille Paquet confirms his considerable talent with this, the second vintage of his Mâcon-Lugny Les Charmes. From a prime, southeast-facing parcel, it’s characterised by aromas of stone-fruit, and a ripe, round palate with a refreshing twist of lemon to finish. Seven months on the lees add body and complexity. A great apéritif and highly versatile food wine. Drink now to 2020.